PROFORE LF is specifically designed for the management of venous leg ulcers and associated conditions. PROFORE LF provides the same effective compression as the as the PROFORE in a latex-free form for allergy sensitive individuals. PROFORE LF may be left in place for up to one week. The system pack can be used on patients with ankle circumferences of greater than 18cm or 7¼ inches (padded). Proven effective in both hospital and community treatment studies, the PROFORE LF system is designed to deliver effective pressure. Profore provides higher pressure at the ankle, with decreasing pressure exhibited at the calf. Even a full week after application, PROFORE LF maintains effective levels of compression. PROFORE LF pads bony prominences for protection and through the use of 2 compression layers, compression is built up gradually. It has sufficient absorptive capacity to manage exudate for up to a full week without needing re-application. The initial applications of PROFORE LF may have to be changed every 3 to 4 days, when drainage is high. Weekly dressing changes reduce the nursing time required for the management of venous leg ulcers. 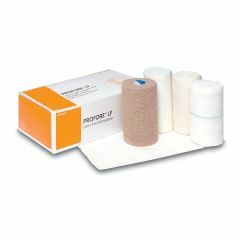 Studies have shown that the multi-layer compression bandage system provides significant savings in cost of care. PROFORE LF system pack contains everything necessary for the application of effective graduated compression therapy. ProfPROFORE LF ore reduces preparation time, simplifies stock control and ensures that the correct components are always available.